Without the de-demonstration of Kirchnerism, it is impossible to understand the different policies being pursued in the country, and half the population will continue to be subject to constant deception. Economic power has the great capacity to permanently change its discourse to cover up every new step it takes in the looting it carries out. There is no fact that justifies the closed hatred of many people with Cristina Fernández de Kirchner (CFK) embodying Kirchnerism in general. This hatred is deep in the bones of a large part of the population, based on the very effective media campaign that “reported” many actions of the previous government that never happened, but they did so following “post-truth” methodology. That is, “it doesn’t matter if what we say is true, but if people believe it”. Of course, in order to achieve this, they had a near monopoly on all the media, TV, radio, newspapers, magazines, internet, etc. For those people who are interested in knowing the truth and doing small or large investigations on their own, alternative websites were enough to expose the lies of the government’s dismissive opposition to the previous government, and those of the current government. But a large part of the population does not carry out this task. And the progressive press, like Page 12, was also demonized, and still is. To create such a false negative image of CFK, they also used a propaganda apparatus aimed at manipulating people’s subjectivity instead of arguing, with some basis, using real facts. Not only was and is Durán Barba, but a whole team of publicists, Argentine and foreign, many of them appointed by the U.S. Embassy, who organized the “subliminal” campaign against Kirchnerism. The previous one was a middle-class government, which respected the general functioning of capitalism; therefore it did not affect economic concentration, large agrarian property and the economy in its almost totality in private, foreign and oligopolistic hands. At the same time, it carried out a very important series of social reforms and infrastructure growth more than any other government in Argentine history, as well as the extension of human rights. Without directly confronting the concentrated and centralized international capital (CCyCI), which is the true power that dominates Argentina and the world, it laid the foundations for a more integral economic development, promoting science and technology, education, health, employment, retirement, the interconnection of long distances with electricity, the beginning of the reconstruction of railways, sewage pipelines, running water and in general it laid the foundations, to a certain extent, for a greater “growth with social inclusion”. In addition, it was freed from the burden of foreign debt, albeit by paying millions of dollars, but much less than the nominal demand for it. The country thus acquired a certain degree of economic independence, and the increase in the number of schools and universities, the recovery of technical schools, the return of more than a thousand scientists to the country and the construction of laboratories to enable them to carry out their work at the level of global technological progress. It manufactured three satellites entirely in the country, which placed it in eighth place in this area. However, the international CCYCI remained intact, made large profits and continued its concentration, centralization, foreignization, oligopolization and privatization. Despite all this, the Kirchnerist government was unbearable for the CCYCI for a multitude of reasons. In the first place because it hindered their open and implacable plundering, as the current government does. Second, because it showed that within capitalism one can live better, and that was increasingly incorporated into the consciousness of the people, who could not know that under capitalism it is impossible to maintain that improvement for long. Big capital always ends up annulling these reforms in one way or another. Thirdly, because a large part of the population began to understand, albeit with distortions inherent in the class-conciliation ideology of Kirchnerism, the nature of the CCyCI, its global economic power, and this increased awareness was becoming increasingly dangerous to the power of big business. 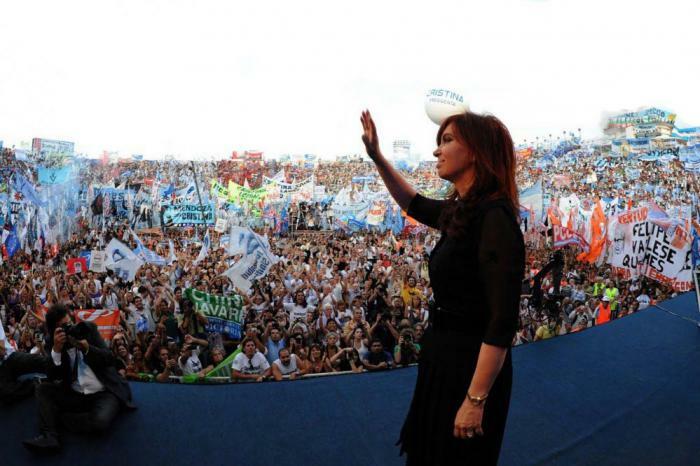 It is now said that CFK cannot be a candidate because she has a limited ceiling as a result of this demonisation. It cannot be that there are candidates, not just CFKs, who are demonized and therefore unable to stand for election, or at least see their presentation as very restricted. It is necessary to know the differences, on the one hand, of a government with all its limitations such as Kirchnerism, but which had sincere intentions to promote “growth with social inclusion”. The main need for the de-demonstration of Kirchnerism lies in being able to see reality objectively, in being able to see the differences between one government and another, between its different politicians, and in its different objectives: the previous “growth with social inclusion”, the current one, looting. And this difference in objectives is reflected in different repressive policies. The previous government promised not to repress social protest, and as far as the national government is concerned, it did 90%. The strategy of the current government is to repress social protest, to repress dissenting voices, to repress anything that may come between its policy of looting with greater or lesser force. The latter is complemented by a very effective and sophisticated policy of deceiving the people. This deception must be fought. Under the previous government, the social struggle was mainly focused on improving living conditions, on going for more, with practically no repression of social protest. In today’s world, the social struggle is increasingly dedicated to preventing murder, repression, unjustified imprisonment, and the freedom of political detainees; in short, the struggle is essentially defensive, rather than “going for more”. The songs insulting the president reveal that a good part of the people have taken note of what the real policy of this government is. The dominant power has a great capacity to permanently deflect political protest that is directed directly at the president and the government in general by constantly inventing scapegoats to replace them. Big capital is causing the crisis, the population is increasing its resistance. The economic power itself is working to divert this protest to the representatives closest to the people, who are the ones who disturb the power. The de-demonstration of Kirchnerism is a necessary condition for advancing in the general consciousness of the people, without which victory over the current dominant world power is impossible.